Halloween is as good a reason as any to get baking. This is a great time to get extra creative and make something a little different. Like some creepy eyeballs for example. Edible of course! In a previous post I spoke about the deliciousness of cake pops. As well as the fact that they are rather time-consuming to make. A special occasion, like a Halloween party definitely warrants a little extra effort. 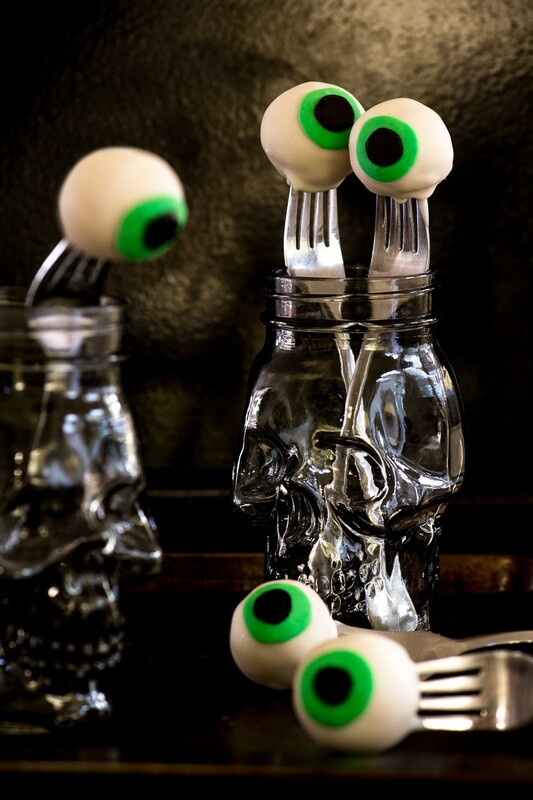 Kids and adults alike will certainly be staring when they see these creepy treats and the treats will be staring right back at them! In my opinion, no Halloween table would be complete without these. I’ve served the eyeballs two ways here, firstly skewered on forks and secondly floating in gloopy red jelly in little jars. 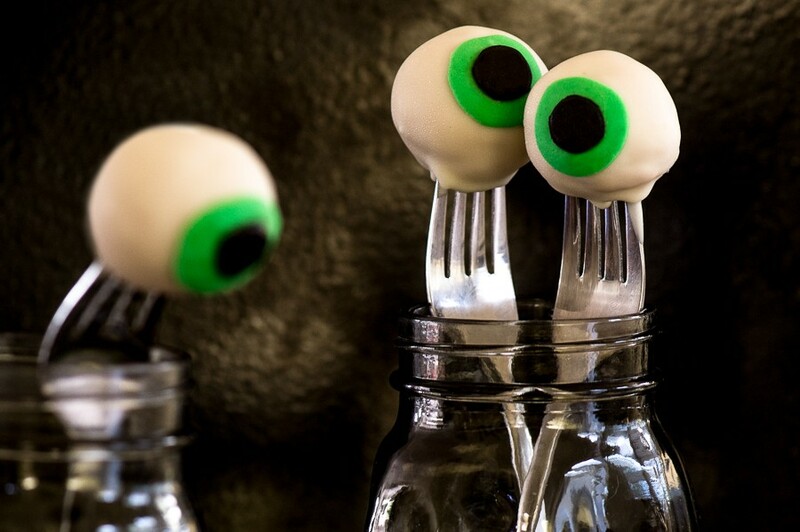 Either way, these creepy googly eyes are disgustingly yummy to eat. Make the vanilla cake according to the directions on the box. Using your hands, crumble the cake into fine crumbs into a large bowl. There should not be any large bits of cake remaining, only crumbs. Add half the icing and mix well. Gradually add more and mix until you have a firm mixture. If you add too much icing the cake pops will be too moist and fall apart. Melt about a quarter of the white chocolate (over a pan of simmering water or in the microwave). Add a little vegetable oil if the chocolate is too thick. Dip a plastic fork into the chocolate and pierce a cake ball. Wipe away any excess chocolate. This ensures the cake ball sticks to the fork. Repeat for all of the cake balls, resting them onto a plate or baking tray and then refrigerate for 30 minutes for the chocolate to set. Melt the remaining chocolate. Dip each cake ball into the chocolate, turning until it is fully coated. Allow the excess chocolate to drip off, then place onto a baking tray lined with greaseproof paper. Repeat for all the eyeballs, then refrigerate until set – about 30 minutes. Roll out the green fondant to 1mm thick. Use a small round cutter (about 2cm in diameter, I used the back of an icing tip) to cut out rounds and stick onto the “eye balls”. Roll out the black fondant and cut a smaller round about 0.5cm diameter (I used cleaned pen lid) and stick into the middle of the green circles. Keep the eyeballs refrigerated until ready to serve. Melt the white chocolate. Using a fork, dip each cake ball into the chocolate, turning until it is fully coated. Allow the excess chocolate to drip off, then place onto a baking tray lined with greaseproof paper. Make the strawberry jelly according the package directions and refrigerate until just starting to set. Immediately before serving, pour the almost-set jelly into little jars and plop an eyeball or two into each. Serve immediately! – I find it easier to work in batches of about 10-12 at a time when making these. If you take all of the rolled cake balls out of the fridge at once, they will start to warm up and soften, making them very difficult to handle. Similarly the chocolate coating will start to harden after a while. Rather melt about a third of the chocolate, dip 10-12 eyeballs and keep the remaining cake balls in the fridge until ready to dip. Then melt some more chocolate and continue with the next batch. – Avoid using a very moist cake mix as this will result in a cake that is too soft to crumble. If the cake is still quite moist the day after baking, then break it up into pieces, spread out on a baking tray and dry out in a low oven at 100°C for 30 minutes, then allow to cool completely. I used the Snowflake Vanilla Cake Mix. – If you can’t find ready-made icing then make your own by beating together 250g softened butter, 500g sifted icing sugar, 5ml vanilla essence and 2tbsp of milk. Beat until smooth. 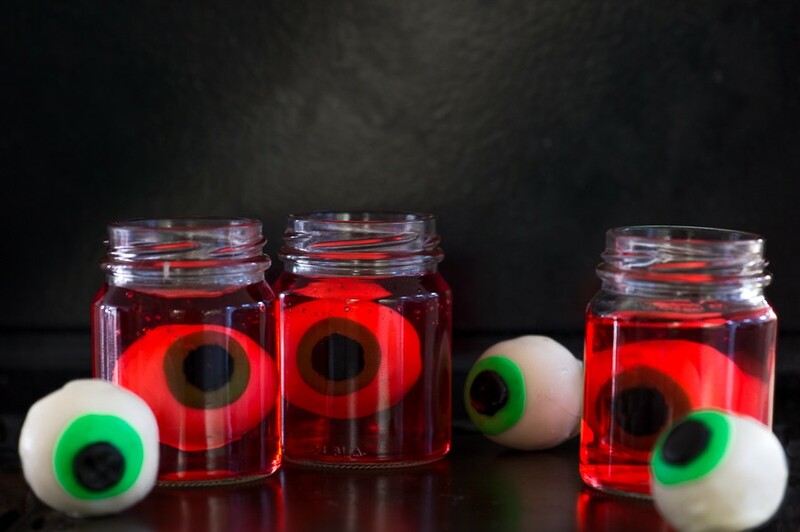 – For the floating eyeballs, the jelly should be almost set but not quite solid. If it is completely set then the eyeball won’t drop in smoothly. If it is already set then leave it at room temperature for a while until it has started to soften a bit. – The colour from the green and black fondant icing tends to run quite soon after dropping the eyeball into the jelly, thats why you have to do this right before serving.